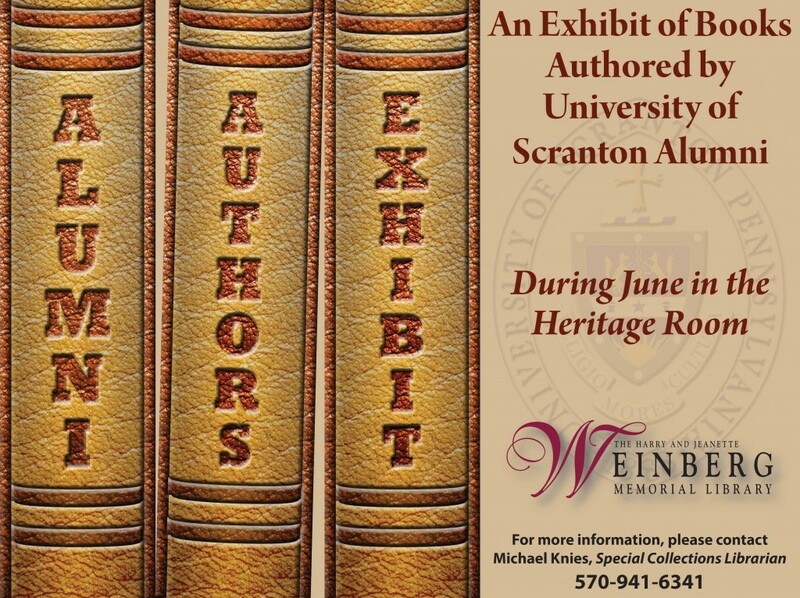 Throughout the month of June, The University of Scranton Alumni Authors Exhibit is on display in the Library’s 5th floor Heritage Room. The exhibit showcases books by more than a hundred alumni authors and includes many signed copies. The range of subjects varies greatly, encompassing alumni who became authors in their academic fields, nonfiction writers, novelists, children’s literature writers, and historians. The earliest former student featured is Clarence Walton, ’37, 10th president of The Catholic University of America and the first layman to hold the position. The youngest graduate featured in the exhibit is Sarah M. Piccini, ’07, G’10, whose local history book, Framing Faith, provides a pictorial history of former churches in the Diocese of Scranton. Also included in the exhibit is Jason Miller, ’61, H’73, who received the 1973 Pulitzer Prize for Drama for his play That Championship Season. Two of our very own Librarians, Bonnie Strohl, G’90, and Kristen Yarmey, G’12, are also alumnae and have books on display in the exhibit. We also have numerous books by alumna and children’s literature writer, Susan Campbell Bartoletti, G’82, who has written a Newberry Honor Book and a Robert F. Sibert Informational Book Medal winner. She is also the recipient of 2013 Friends of the Weinberg Library Royden B. Davis, S.J., Distinguished Author Award. We encourage you to explore this wonderful exhibit and celebrate our alumni and their important contributions in the publishing world. The exhibit is on display during normal library hours. For more information, please contact Michael Knies, Special Collections Librarian, (570) 941-6341.